Hello! My name is Sophie Luesby and I am a newly appointed Canadian ambassador for the University of Surrey. I thought as a first post it would be nice to introduce myself. So here it goes! I come from a small town in Ontario near Ottawa where I’ve lived with my parents my whole life – I’ve never moved. Je suis Franco-Ontarienne donc toute mon école avant l’Université a été complété en français. After finishing pre-school, middle-school and high-school in this small town, I decided to stay close to home and attend the University of Ottawa. There I completed a four year Honours Bachelor of Health Sciences in the hopes that I would one day get admitted to medical school. However, my undergrad didn’t go as well as I had expected as I had a hard time adapting to the University’s way of evaluating and grading. By my second year I was really reevaluating my goals for post-grad… as much as I was enjoying the material I was studying, I was not enjoying university life in general. I decided to focus on learning rather than competing and riding out the wave I was on. By my last year, I finally felt like I had gotten the hang of school at uOttawa and got more involved on campus. I started becoming very interested in chiropracting and was exploring that avenue for post-grad school. However, despite loving the science aspect of chiropracting, I was not so into the business side of the field. Although I have always had an interest for Law (I remember my mom talking to me about it as a child), my strengths had always been in the sciences and so I never gave the field much consideration as a career. It wasn’t until Oscar night 2016 while sitting on the couch with my Godmother, tante Annette, that I truly gave law school serious thought. See, her daughter Gabrielle was a first year law student at the University of Surrey at the time and she had only wonderful things to say about her experience in England. Despite having never traveled outside of North America, having no money to pay for such a venture and being quite the homebody, I applied with growing excitement. Before I knew it I had accepted my offer to the two year Law (JD Pathway) LLB (Hons) program at the University of Surrey, applied for a Visa, applied for loans and line of credit, and booked my flight to England! It was quite the whirlwind but to this day I do not regret my decision to come to Surrey and I hope that by sharing my experiences with you that you might too take an extraordinary plunge in a direction you had never imagined yourself taking before. 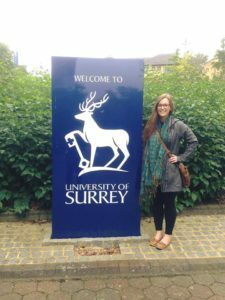 Through this blog I hope to share details about the school and my program, my experience in accommodation and with the services available on campus, my trips exploring more of the town of Guildford and of the country of England in general, and finally, lists of my favorite places to eat and hangout. Ps. Can someone send me some Timbits please?